You are here: Home / Currently Featured / Free Flow Wines – changing the game one tap at a time! Just north of San Francisco, a dedicated band of engaging entrepreneurs is quietly driving what many think is one of the hottest, most consumer-friendly trends currently lighting up the world of wine – wine on tap. Row upon row of sleek, silver kegs waiting to be filled with premium wines crowd the staging area at the Free Flow Wines production facility in Sonoma county. Once processed, these kegs will be shipped to numerous markets to be served tap style from an ever burgeoning list of on-premise establishments across North America! Dan Donahoe along with his partner Jordan Kivelstadt, have quickly jumped to the forefront of a movement that seems to suit the lifestyle of the new powerhouse wine consumer – the Millennial. I recently had a chat with Dan about his journey in the industry and the goals of his new venture, Free Flow Wines. SlaveToTheGrape: You got your start in the wine business through a friend of the family in the early nineties in California. Can you tell us a little bit about that? Free Flow Wines Co-founder, Dan Donahoe. 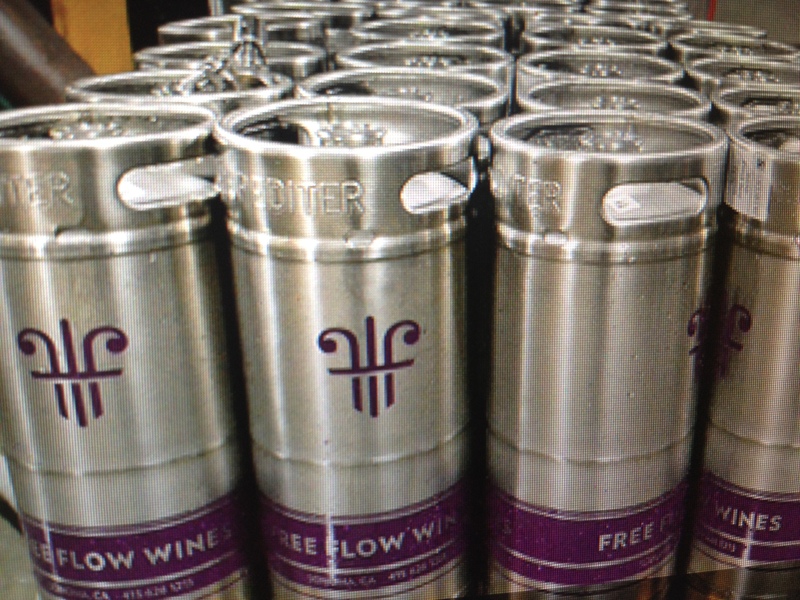 Free Flow Wines: Absolutely. Julia Child was my grandmother’s best friend growing up in Los Angeles in the ‘20’s. As soon as I enrolled at Boston University, my Grandmother introduced me to Julia who was still doing TV spots and publishing cookbooks. I had the good fortune to attend many innumerable-course dinners, events and tastings with Julia throughout my tenure at BU. She introduced me to many of the legends of the wine business, who subsequently mentored me early in my career. STTG: You went from the production side of the business at Cakebread cellars to the retail space with John Walker. What was your role at John Walker and what was the market like at that time? FFW: After leaving Cakebread in the late Fall of 1992, I applied for a floor sales job at the legendary John Walker & Company Wines & Spirits in downtown SF. Mind you, this was THE fine wine and spirits shop on the west coast, founded just after the repeal of Prohibition in 1933. I knew nothing about retail, but knew I liked interacting with people as opposed to barrels and tanks in a winery. STTG: After a stint in retail you left the wine industry for a time to join the corporate world but ultimately returned to make your own wine. Can you tell us why you left the industry and what drove your desire to make and market your own label? FFW: I left the wine business in 1993 to seek a broader horizon and experience in the business world as a whole. I learned a great deal in that corporate world, from Wall Street to the dot-com boom (and bust). I can attribute a great deal of my business acumen and sales training to a few of the best that I met in those years, who were mentors and are friends to this day. However, I never lost my passion for wine. After one-too-many corporate, expense-account dinners in which I was handed the wine list by the boss, who said, “hey, Dan knows wine; let’s have him order it!” I knew I wanted to be back in the industry. STTG: Were you making your own wine (Teira) yourself or was this a collaborative effort? FFW: Teira Wines began as a small negociant project, in which I purchased a number of barrels of a single lot of Zinfandel from the Dogtown Vineyard in Lodi from some friends in the business and bottled 300 cases. These 300 cases went quickly, given that my first customer was Gary Danko restaurant. My second vintage, and all thereafter, have been a collaboration with my friend and winemaker Bill Knuttel. Since that second vintage, we have grown the brand to include estate-grown wines from Dry Creek Valley. STTG: In the course of promoting your own label you received a call from a sommelier in Atlanta that would set you on a path to what you are doing now. What was the nature of the call? FFW: I got a call from a restaurateur named Todd Rushing. Todd pioneered the concept of premium wine on tap in 2005, upon opening his second restaurant in Atlanta: TWO Urban Licks. Todd had visited innumerable wineries in his restaurant career, and always noticed the kegs lying around wineries. When asking the winemaker what those kegs were for, he always got the brush-off of “oh, that’s just the topping wine, meant for the same wine that’s ageing and evaporating as it ages in the barrel.” Todd asked himself, “why can’t I have that same wine on tap at my restaurant?” And, with that question, opened TWO Urban Licks with 42 wines on tap. In his quest to find delicious wines on tap, he took to calling guys like me and asking if we would fill his kegs up with our fine wines. STTG: Was your visit to Two Urban Licks restaurant where you saw firsthand the scope of the tap wine operation he was running the ultimate spark for FreeFlow wines?